An autorefractor assists the doctor in determining the lens power required to accurately focus light on your retina. Autorefractors are especially helpful for determining an eyeglass prescription for young children and other patients who may have trouble sitting still, paying attention and providing feedback that the eye doctor needs to perform an accurate manual refraction. 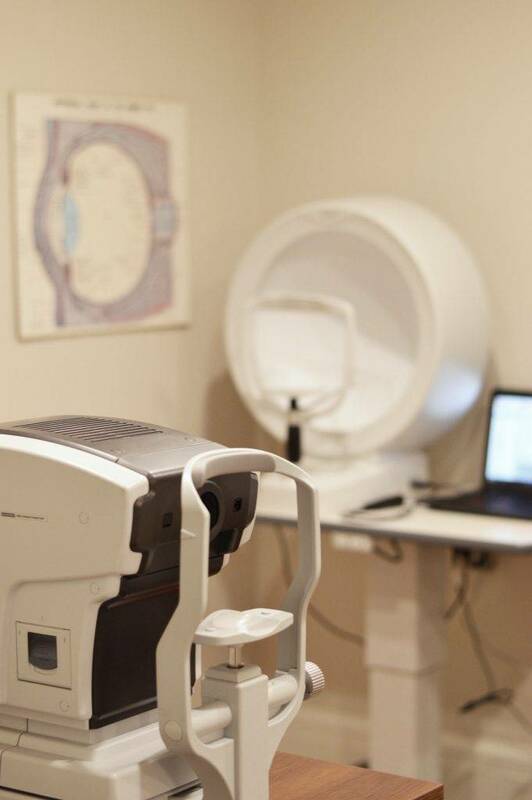 This is very important in assisting Dr. Klaming to detect and measure any changes to your retina each time you get your eyes examined, as many eye conditions, such as glaucoma, diabetic retinopathy and macular degeneration are diagnosed by detecting changes over time. The test begins with you putting your chin on the machine's chin rest. While you look at a light inside the machine, the doctor or a trained assistant will puff a small burst of air at your open eye. It is completely painless, and the tonometer does not touch your eye. Each eye is tested separately and the test can take from 5 minutes to 20 minutes depending on the type of test. Your optometrist may ask only for a driving licence visual field test, which takes 5-10 minutes. If you have just asked for a driving test or the clinic doctor advised you have one, you will be informed of the result by the clinic doctor, in writing, in a few weeks. Eye See Eye Learn is a relatively new program in Ontario. Learn how you can help your child achieve clear vision. Help navigating different eye surgeries such as cataract and LASIK.